has a natural antioxidant effect. 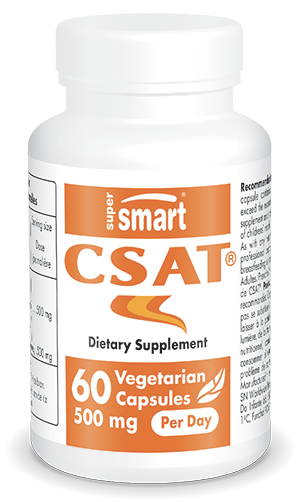 Our dietary supplement CSAT® helps prevent weight gain due to its formulation with a patented carob extract. This is obtained from the carob tree Ceratonia siliqua L., which is primarily cultivated in the Iberian Peninsula, and it is the carob pods which are used in the formulation of this supplement. Carob has attracted scientific interest due to its antioxidant potential and high content in galactomannans, soluble plant fibres with a number of benefits for weight control. Galactomannans have been studied extensively for their ability to combat excess weight and promote weight loss in those who are overweight or obese. Carob appears to be particularly effective at reducing the urge to snack. It is carob’s unique content in galactomannan plant fibres which are responsible for its weight loss benefits. Once ingested, these polysaccharide compounds have a specific effect on the digestive system, forming a soluble, viscous mass. This natural gum makes the stomach’s contents empty at a slower rate, prolonging the sense of satiety. Carob thus offers substantial benefits for reducing feelings of hunger, cravings and the desire to snack, a significant attribute given that compulsive snacking is a major factor in weight gain. Indeed, many scientists attribute carob with hunger-suppressing and slimming effects. Some studies suggest that the presence of carob in the stomach could also promote the elimination of excess calories during stomach emptying. Carob’s benefits also include a high content in natural antioxidants such as gallic acid and several of its derivatives. These molecules’ antioxidant potency help protect the body from oxidative stress, a harmful process frequently observed in uncontrolled excess weight. Consistent with our commitment to quality, this new CSAT® supplement has an optimal system of traceability. It is constantly controlled during formulation, producing a high quality carob extract free from pathogenic germs such as Escherichia coli and Staphylococcus aureus. The carob supplement is also tested for pesticides and heavy metals to rule out the presence of dangerous molecules such as lead, arsenic, mercury and cadmium. CSAT® is formulated from a patented carob extract uniquely standardised to 30% galactomannans. This composition means that the hunger-suppressing benefits of these natural fibres are maintained throughout the day. Quick and easy to take, the supplement is in capsule form with a suggested dose of 2 capsules a day. For optimal efficacy, CSAT® should be taken just before your main meal. In certain cases, a therapist may recommend taking CSAT® before the second main meal too. Other hunger-suppressing supplements can also help improve appetite control such as Appetite Control Formula, Relora® and Zero Craving.
. Other ingredients: magnesium stearate, maltodextrin, microcrystalline cellulose. adults. Take 2 capsules a day. Each capsule contains 250 mg of CSAT®.